MilitaryVetsPX.com - Boatswain's Mate BM for sale. This is the appropriate rating patch for US Navy personnel with the rating of Boatswain's Mate BM1, BM2, or BM3. Navy rates are only sold as first class rates and can be cut to second or third class. Boatswain's Mates (BM) train and supervise Navy personnel in marlinspike (marine ropework), deck activities, and boat seamanship. They also oversee the maintenance of a ship's external structure and deck. 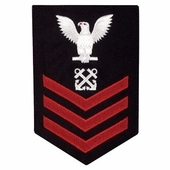 Boatswain's mates may also act as petty officers in charge of small craft serving as master-at-arms and gun crew or damage control party members.